No. 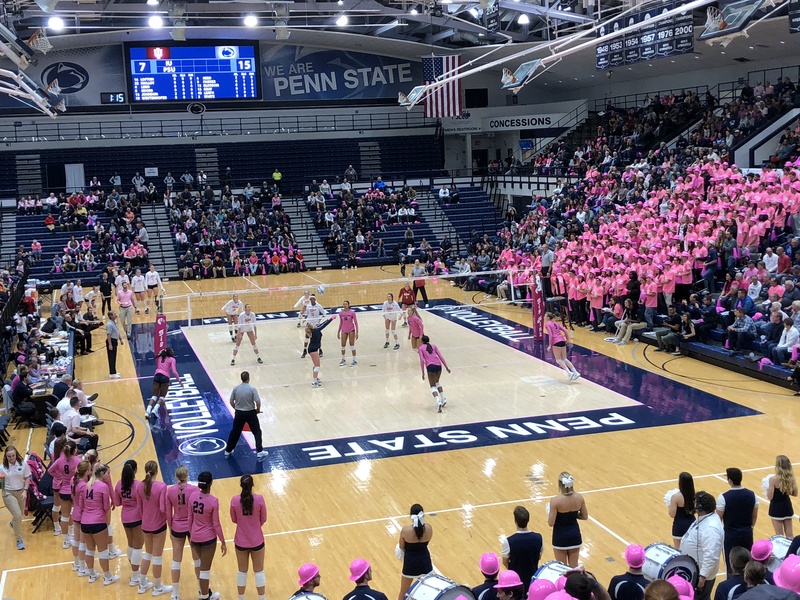 4 Penn State women’s volleyball swept Indiana 3-0 (25-18, 25-19, 25-18) Friday night at Rec Hall in the program’s annual Dig Pink match. Jonni Parker and Nia Reed combined for 28 kills in the victory, which saw the Nittany Lions hit .486 as a team in the third set. Parker finished with a match-high 16 kills and eight digs against the Hoosiers. Freshman setter Gabby Blossom had a career-high 41 assists and 12 digs to secure the lone double-double of the night. Bryanna Weiskircher was in uniform on Penn State’s bench, but didn’t see any playing time versus head coach Steve Aird’s squad. Kendall White tallied a match-high 19 digs and five assists against her home state Hoosiers. Kaitlyn Hord, Taylor Leath, and Tori Gorrell combined for 18 kills to round out the scoring, with freshman middle blocker Serena Gray failing to connect on any of her four swings. Jenna Hampton recorded five digs off the bench. The Nittany Lions (18-3) return to Rec Hall Saturday at 8 p.m. when they host No. 17 Purdue. Penn State beat the Boilermakers 3-1 on October 10 in West Lafayette. “I thought we needed to play well, and we came out and played really well at the beginning of the first game. I thought we hit really well in the third game. We had to change the lineup around a little bit, but I thought Gabby did a terrific job in the setting position. Kendall and Jenna passed well and played good defense. Nia and Jonni scored well offensively. “I think she connects well with the hitters. I recruited her to play. She identified to me she’s been a back-row player for a couple months, so I wanted to see if she could handle more than just being a back-row player. She was brought in to play. “I just love the way Kaitlyn comes on the court and is always just smiling. Kaitlyn’s a beam of energy and sunshine. You know what she’s going to do. You know where she’s going to be. Dennis [Hohenshelt] is telling her where to go and she goes and does it. She doesn’t hesitate. She goes for balls. “I’ve known that all season. So much of what we want to do is based on the health of players. We haven’t had a week of practice where everybody’s healthy. Part of our system was like their system, where there’s always two setters going in and out and you need multiple hitters. We’ve been limited by people who have been dinged up. Sometimes they can practice. Sometimes they can’t practice, and when you can’t practice it’s hard for the team to get better.